That really inspired me and made me realize that I’m not doing most of those things – especially 2 and 5 – so I decided to start with number 7 by sharing it with you guys! Sometimes all we need is a little perspective. 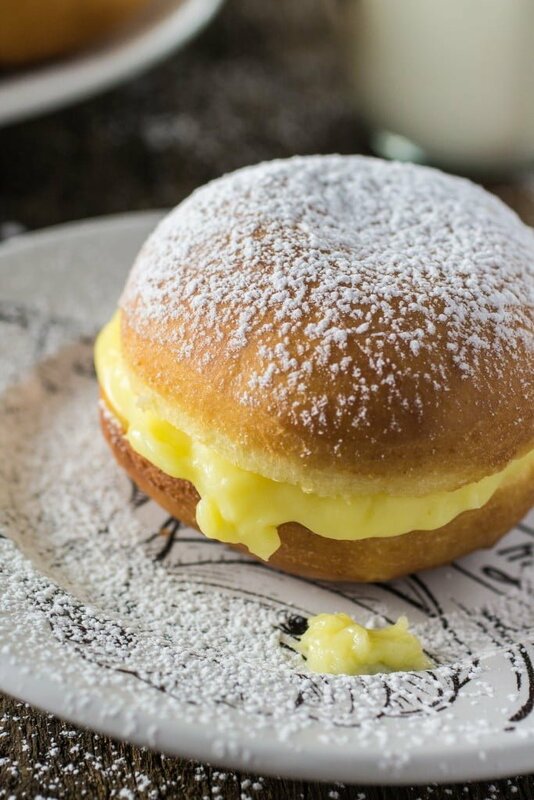 Anyway, these Brazilian Cream Doughnuts are a version of the German Berliners, probably brought by the Germans when they immigrated to Brazil. They are very popular in my country and you will find them in every padaria (bakeries). 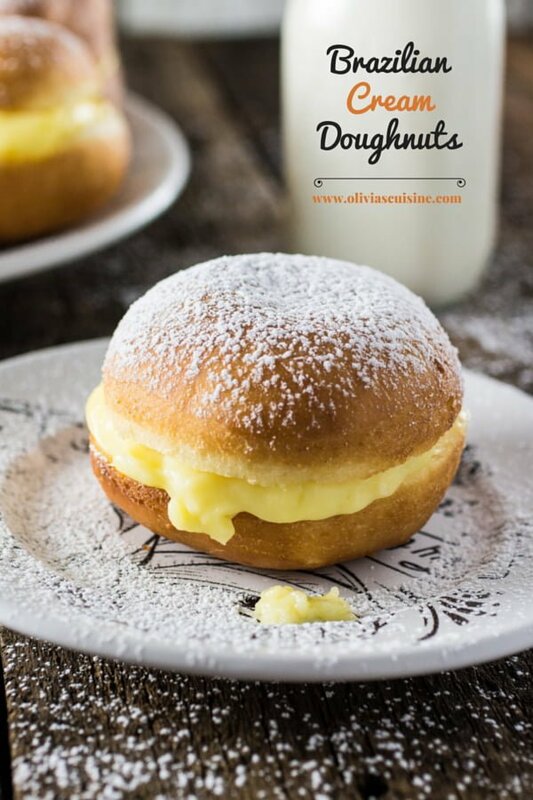 Before deciding to make these cream doughnuts – I was seriously craving them and now that I live in the U.S. it’s either make it or cry, because it’s not like I can go to the padaria to get it! – I had never made doughnuts before. I just had this idea that it would be incredibly difficult and complicated. It’s so easy!!! With the aid of my stand mixer, I barely had to do anything but put the ingredients in the mixer, wait for the doughnuts to rise, fry them, make the cream and fill them. I was utterly impressed. Better yet, I brought them to work and they were utterly impressed! My co-worker Bill even said: “How does a human being make something like that?”. I don’t know about you, but in my book being called an E.T. is one of the best compliments ever! The difference between Brazilian doughnuts and regular doughnuts? They are much lighter in texture. Because of that they are perfect for breakfast, brunch or even an afternoon treat. Brazilians usually enjoy them with a cup of coffee! Also, they might seem a little too much (although you can make them any size you’d like!) but you will see… there will be no way of stopping you from eating the whole thing! 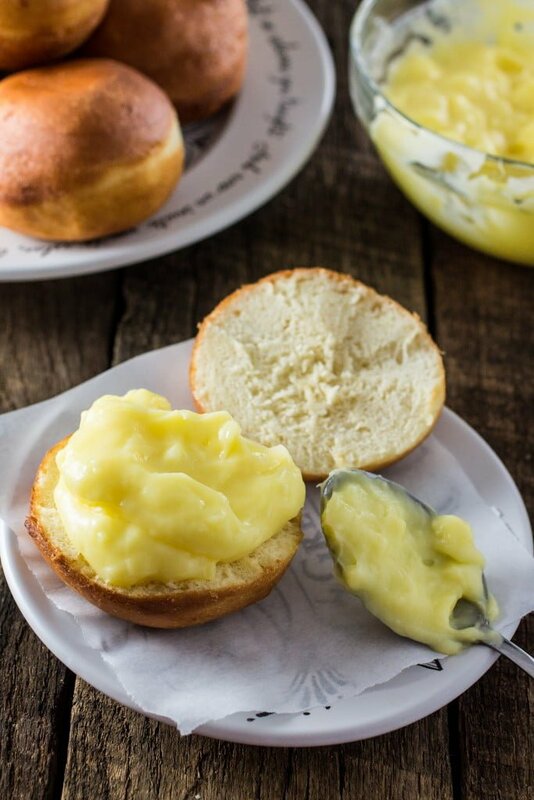 I think these will be amazing for your Mother’s Day brunch! Pour the yeast into the milk and stir to combine. Let it sit for at least 5 minutes. In the bowl of a stand mixer, add all dry ingredients and mix to combine. Add the egg yolks, butter and milk/yeast and mix it on low until everything is mixed together. Turn the speed up to medium and let the machine knead the dough for about 8 minutes or until the dough is soft and smooth. Transfer the dough to a large bowl, cover with a towel and let it rise for 20 minutes. Turn the dough out onto a floured board. Gently pat it (don’t use a rolling pin!) until about 1/2 inch thick. Cover with a kitchen towel and let it rise again until doubled in size, about 30 minutes. Heat a pot of oil, over medium heat, until a candy or deep fry thermometer reads 375 degrees. If you don’t have a thermometer, just toss an unlighted match into the oil when you think the oil is hot enough. If the match lights, then you can start frying your doughnuts. Fry the doughnuts until golden brown and set them onto paper towels to absorb the extra grease. Cut them in half and fill with the cream. Dust some confectioner’s sugar and cinnamon (optional) on the doughty and serve. Start by mixing the corn starch on 1/3 of the milk until dissolved. Add the milk, the sugar, the egg yolks and the corn starched dissolved on the rest of the milk to a sauce pan and cook, over medium heat, for about 5 to 10 minutes or until thickened. Turn the heat off and add the vanilla extract and the lime zest, if using. Let it cool before filling the doughnuts. Olivia, doughnuts look scrumptious! and I like your to’do list. I can use all of it :) It happens with me all the time that what I intended to share makes to blog very late :( but show must go on!! Heck yes, I WANT! These look amazing! oh dear, it’s never easy! hugs my friend, I hope your dog feels better, it’s especially hard when you are far away from home :( I like that list you shared, we all need to do that! The donuts look gorgeous , love the amount of cream you filled in! Olivia, I hope poor Guiny gets to feeling better soon! These doughnuts are gorgeous! 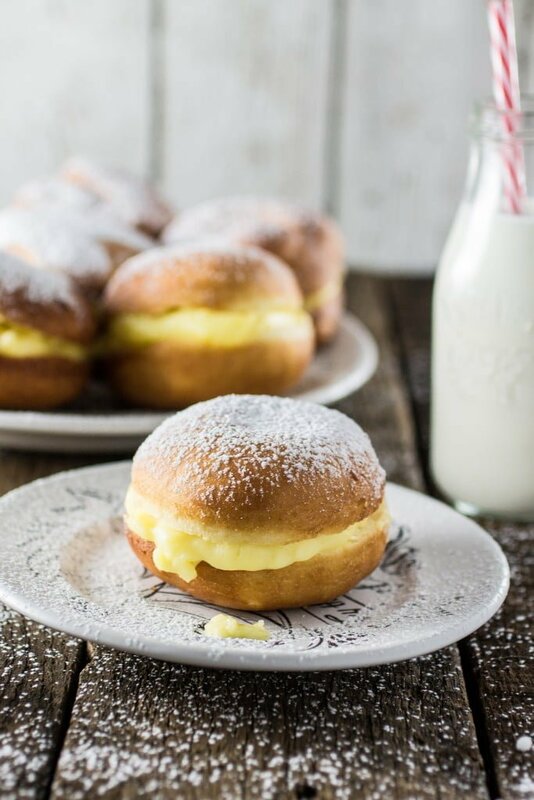 They look like heavenly doughnut sandwiches!